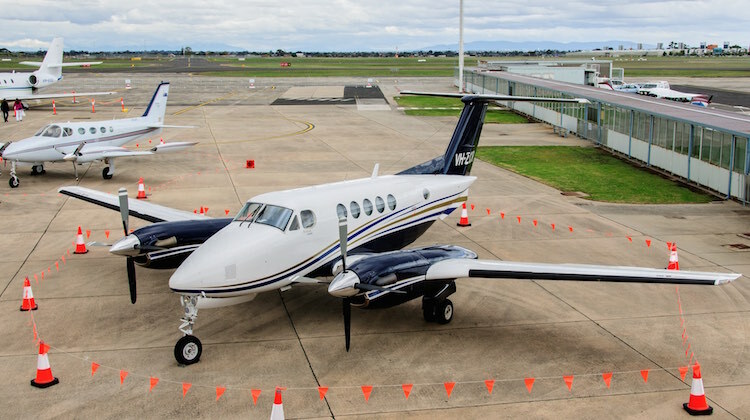 The Australian Transport Safety Bureau (ATSB) has opened an investigation into the crash of Beechcraft B200 Super King Air VH-ZCR at Essendon Airport on Tuesday due to what Victoria Police has described as a “catastrophic engine failure”. The aircraft impacted the DFO shopping centre alongside the airport resulting in a major fire. Emergency services – the Metropolitan Fire Brigade, Ambulance Victoria and Victoria Police – were quickly on the scene. The King Air was operating a private charter flight to King Island and carrying four passengers. All on board the aircraft, pilot Max Quartermain and his four American passengers, died in the accident. Victoria Police Assistant Commissioner Stephen Leane told reporters in Melbourne on Tuesday that the accident happened moments after the aircraft had taken off from Essendon Airport. “A charter plane, a twin-engine plane left the Essendon Airport and shortly after takeoff had a catastrophic engine failure,” Leane said. Victoria Premier Daniel Andrews said it was a “desperately sad day for our state”. “A number of people have died as a result of what is the worst civil aviation accident that our state has seen for 30 years,” Andrews told reporters. A search on the Civil Aviation Safety Authority (CASA) website showed VH-ZCR was manufactured in 1996, with Australian Corporate Jet Centres the registered operator. Essendon Airport chief executive Chris Cowan said in a statement the airport was “working with all authorities to determine the cause of the incident”. “Essendon Airport confirms an incident involving a Beechcraft King Air at approximately 9am this morning. The incident occurred on departure from Runway 17,” Cowan said. The airport has been closed for all flights other than for essential emergency services, with all traffic diverted to Melbourne and Avalon airports. Meanwhile, the DFO shopping centre was closed until further notice. Assistant Commissioner Leane said no one in the shopping centre was killed as a result of the accident. Sections of the Tullamarine and Calder freeways were also closed. Essendon Airport and its surrounding commercial precinct Essendon Fields are run by Essendon Airport Pty Ltd, a joint-venture company held by Linfox and Beck Corporation. It holds a long-term lease to operate and develop the airport. The lease is for 50 years with an option for a further term of 49 years, ending on June 30 2098. In addition to being a busy charter airport, Essendon has regular public transport (RPT) service from Free Spirit Airlines, Jetgo and Sharp Airlines, according to the airport’s website, serving regional centres such as Dubbo, Flinders Island and Merimbula. Alliance Airlines also operates charter flights from the airport. The heritage-listed main passenger terminal was undergoing a $20 million refurbishment due to be completed in late 2017. The airport has also improved runway overlays and built two new hangars in recent times. The airport is also the home base to about 40 corporate jets and is understood to have the most number of international movements outside of the major airports in Australia. The likes of ExecuJet and Executive Airlines are based at Essendon, as well as Victoria’s emergency services fleet. Meanwhile, in addition to the DFO, the Essendon Fields precinct features car dealerships and a 166-room hotel. The Victorian Premier declined to answer questions regarding whether Essendon Airport should be closed given its proximity to nearby shopping and residential areas. Those calls are reminiscent of those that arose following a December 1993 incident when a de Havilland DH-104 operating a night charter dinner flight suffered a partial engine failure shortly after takeoff from Essendon Airport’s Runway 17 before it crashing into a residential area adjoining the aerodrome. The aircraft hit powerlines and crashed into four houses. Thankfully, everyone on board – eight passengers, a flight attendant and the pilot – plus those in their homes survived the accident. The ATSB report on the 1993 incident can be read on the ATSB website. I still think the freakiest thing (in my eyes) is that if this were 10 minutes later this would have landed directly on my dad who delivers there literally every day. Our hearts go out to our American brothers. 1 Pilot error. The pilot had an engine failure in the left engine, (seen from the slight movement to the left on the displayed track), and unfortunately he misidentified the engine that had failed – happens more often than one would like, As far as I know that particular model of KingAir did not have autofeather, a feature which allows the aircraft to automatically adjust the flight conditions so the aircraft can keep flying safely on one engine. Another possibility – he had not turned on the fuel controls – situated near his left leg. 2. There was some kind of disastrous mechanical failure of the controls, coupled with one or both engines failing, which prevented the pilot from maintaining control of the aircraft. Couple things about this are curious to me as a pilot. Runway 17 departure, some sort of “catastrophic engine failure”, then crash into the mall on the south east side of the departure end of runway 17. What I think is curious is that in the only video that I can find of the aircraft shortly before the crash is from a highway (maybe car dash) camera that appears to be viewing the aircraft from westbound route M79. The aircraft moves left-to-right in the video before impacting the mall. That direction would be north – did the pilot execute an immediate course reversal and then fail in an attempt to make the airfield? Also, wings looked level, so not the typical twin-engine departure, 1 engine-out wingover crash. Was there total engine failure (2 engines out)? Seems strange that the pilot would have been forced down short of the field, while maintaining wings level, with one engine running. The federal government must take some blame in this, allowing inappropriate development on airport land. Expert advice is ignored when there is money to be made! @Phelps, that video you refer to is probably looking north along Bulla Rd on the overpass over the Tullamarine Fwy. That is consistent with the King Air veering left just after take-off. It seems the pilot let the aircraft drift towards the dead-engine, so he was probably not using enough right rudder and wasn’t banked into the live engine. The video is fuzzy, but it looks like the undercarriage was retracted, or retracting, but the key is was the left prop feathered? Our thoughts and prayers must be for the families and friends of those onboard. Please let the relevant authorities get on with their investigation unhindered by the opinions of armchair experts. Very tragic time for all concerned. I believe the dash cam footage you’re referring to is from Bulla Road: the “diagonal” road heading northwest in the lower right hand corner of the picture. Runway 17 is to the left of this road, and so the aircraft would have come from left to right as it veered to its left prior to the crash. Build the suburbs right up to the aerodrome boundaries, then put a shopping centre on the aerodrome itself. No room for error left anywhere! Who could possible have predicted this? Wow, who needs the ATSB when we have so many experts right here? Why don’t we have some respect and keep our opinions to ourselves and let the investigation run its course!